Tis the season for Twilight. I realized this in Nordstrom's, where I was perusing the makeup counters and came across the new Twilight lip gloss: Venom. It's this strange mix like those science experiments in grade school where you put oil and water in a 2 liter soda bottle with a little food coloring and spend hours shaking it up and watching it separate. With Venom, it's a clear substance and a dark red stuff churning around in a tiny $16 container. The clear stuff is a gloss with a plumper in it, which tastes like cinnamon and is supposed to irritate your lips enough to swell. The red stuff is meant to stain your mouth the color of blood. And in the five minutes I was standing there, the clerk sold three vials. Twilight lip gloss, people. A sign of the apocalypse? :) I can't help but wonder if Stephanie Meyer thinks it's absolutely bonkers too. 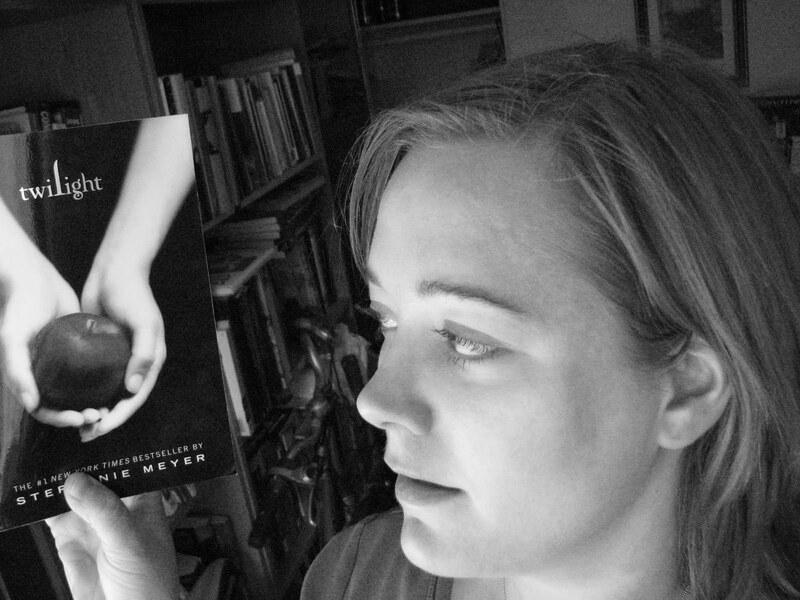 I've been thinking a lot about Stephanie Meyer lately. I remember her in those earlier interviews, where she was just aglow with the excitement of it all. She was having dinner with her characters, in costume! She was sitting on a movie set while they shot the meadow scene! Could a writer's life get better than that?! And last week I saw her on Oprah and she looked. . . strained. And I wondered, have we crossed the threshold where everything's gone from really super cool for her to where it's just totally insane? Lately I've seen a lot of attacks on Stephanie Meyer and the Twilight saga. I can't cruise around Facebook without seeing some comment about how lame Twilight is and how stumped people are (especially other writers) by its success. Some of this I rack up to the anti-mob mentality. In order to feel like they are true individuals with good taste, many people will staunchly oppose the "it" thing. Titanic. Harry Potter. Twilight. And there's something to that, I suppose. I cried like a baby at Titanic, but even I was ready to chuck my radio out the window when "My Heart Will Go On" came on for the umpteenth time every hour. There's such a thing as death by overexposure. Like most "it" things, I came to Twilight late. I'd heard of it. But I was busy. I only started to pay better attention when the movie came out. I love movies. And I love vampires. I am a Buffy fan to the core, and a big fan of Sookie Stackhouse to boot. So I rented Twilight the weekend it came to DVD. The first thing I remember thinking about it was that I would have LOVED it when I was sixteen. I would have been writing fan-fic about Bella and Edward for sure. And at age 30, I still found it mysteriously compelling. But that was BEFORE I wrote my novel. When my novel did come to me, not much later, Stephanie Meyer was constantly lingering in the back of my mind, and not simply because of her success, not because she supposedly sold Twilight for a $750,000 advance or made 52 million dollars last year or all the other things that make her the epitome of what it is to be a triumph as a YA writer. But because I knew more about her by then. She was a mother with small children. And one day she just started writing, not to become a gazillionaire or a world-famous author, but because she wanted to know how a story ended. And she wrote to find not only the story, but herself again. And I was finding that being a good storyteller is a heck of a lot harder, in many, many ways, than being a good writer. I've always had a good ear for the language. But the story, the complexities of the characters, the way you have to keep all their threads untangled in your head, the way you must set them in tense, powerful moments that resonate with the reader and follow through with them, that, is really freaking hard. And with that kind of thing, the proof is in the pudding. And Stephanie Meyer is all pudding, no matter what you think of the writing itself. Her story speaks to people. That's undeniable. When I find myself tempted to come to Stephanie Meyer's defense these days, I remind myself: pudding. The girl can take care of herself. So I'm content to simply cheer for her, to show solidarity for a fellow writer. And I try not to envy her for her incredible success. And I try to allow myself to dream of big things, because sometimes big things happen to unsuspecting people, and sometimes the little things can change absolutely everything. Sometimes the universe gives you a gift. A story. And it's worth it. I know that even if my book doesn't make a dime, that's the case for me.